The Incredibles are Honorary Chairs for Library Card Sign-up Month 2018! This September, Disney Pixar's superhero family, the Incredibles, will team up with the American Library Association (ALA) to promote the value of a library card. As honorary chairs, the Incredibles will remind families, students and people of all ages that signing up for a library card is a great step toward a truly super lifestyle: libraries offer fun and informative resources to help you pursue your passions and succeed in school. In Incredibles 2, in theaters starting June 15, Helen (voice of Holly Hunter) is in the spotlight, while Bob (voice of Craig T. Nelson) navigates the day-to-day heroics of “normal” life at home when a new villain hatches a brilliant and dangerous plot that only the Incredibles can overcome together. Throughout the summer, ALA will be providing a variety of free tools and ideas for promoting Library Card Sign-up Month in your local community. Plus, be sure to visit the ALA Store to purchase Library Card Sign-up Month posters, stickers and bookmarks. Follow I Love Libraries on Facebook and Twitter and the hashtag #LibraryCardSignUp to join the celebration on social media. Join the new Library Card Sign-up Month Community in ALA Connect to brainstorm ideas with fellow library professionals and stay up-to-date with Library Card Sign-up Month news! ALA Membership is not required. Anyone can create an ALA Connect account and join the discussion free of charge. As an added bonus, everyone who joins will receive a free LCSUM social media graphic later this summer, plus be entered for a chance to win a Library Card Sign-up Month swag set from the ALA Store. Tell us why your library is incredible for a chance to win! Libraries have and do amazing things—they give everyone a chance to explore their passions and become their best selves through media, resources, lifelong learning, and more. 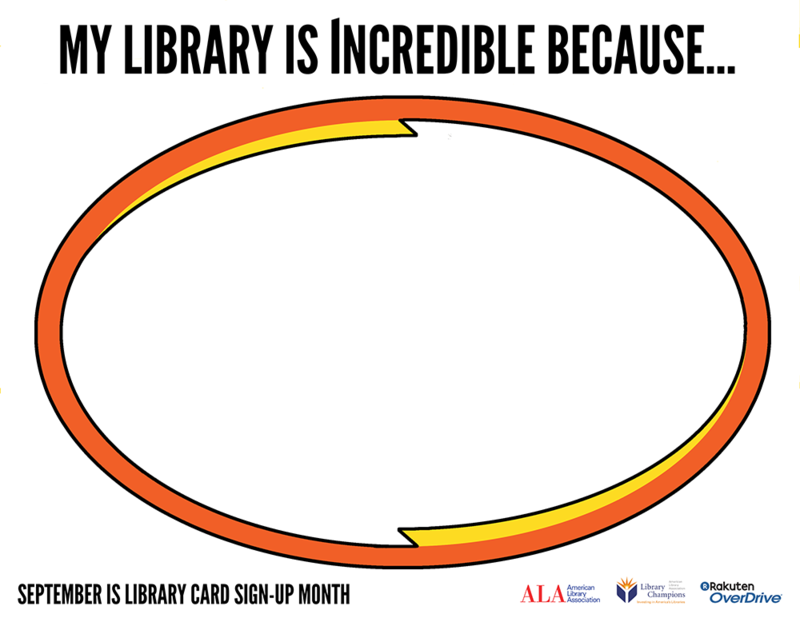 In honor of our 2018 Library Card Sign-up Month Honorary Chairs, the Incredibles, we want to know: what makes your library incredible? Share your answer using text, photos, or a short video on Twitter or Instagram using the hashtag #MyLibraryIsIncredible. Entries can also be posted directly to the I Love Libraries Facebook page. One randomly selected winner will receive a VISA gift card worth $100.00 USD. Need a prop? Download this printable PDF. Promotion begins Saturday, September 1 at noon CT and ends Friday, September 21 at noon CT. Librarians and members of the public are all encouraged to participate. Join the celebration and tell the world your #MyLibraryIsIncredible story! We set up an Library Card Sign-up Month photobooth at ALA Annual Conference this year, and it was a big hit. Thinking about doing something similar at your library or a local community event? Incredibles standees, masks and t-shirts are available online for a reasonable price. In case they're useful, we've provided graphics for the props we used. Click the images at right to download. It’s #LibraryCardSignUp Month! Celebrate by visiting your #library this September to get your very own library card. Check out something incredible at your #library! Happy #LibraryCardSignUp Month! Four new Libraries Transform Because statements were created for Library Card Sign-up Month. Download digital and print graphics and get promotional ideas for using them on the Libraries Transform website. Want to reach out to the 18 to 24-year-old demographic? Seventy-eight percent are on Snapchat. The platform's On-Demand Geofilter feature lets organizations pay to make a custom Filter design available in their area. Pricing varies based on how long the Filter lasts and the size of the location you choose, but a day-long Filter in a single building can cost as little as $5–10! Use this free Snapchat Geofilter design to join the fun. Add your library's name tp the blank template to customize. Snapchat Filter Template | Customizable Snapchat Filter Template | Check these instructions (PDF) for tips about using the Snapchat Filters. Customizable Facebook frame | The Proud Library Card Holder Frame will be available on Facebook under "Effects" or by searching "American Library Association." To access files for library card artwork and billboard, please fill out the Licensing Agreement (PDF) and email to campaign@ala.org. Please note: our licensing agreement with Pixar does not permit modification of the Incredibles image on the downloadable graphics. Please take a moment to tell us about your plans for Library Card Sign-up Month. Be sure to visit the ALA Store to purchase Library Card Sign-up Month posters, stickers and bookmarks. How to Leverage Snoopy to Run a Library-Card Sign-Up Campaign (May 2016) with Jeff Julian, Director of ALA's Public Awareness Office, and Megan McFarlane, Campaign Coordinator. Using Door-to-door Marketing for Library Card Sign-ups (October 2015) with John Chrastka, Executive Director of EveryLibrary. Thank you to Disney Publishing Worldwide for offering The Incredibles as 2018 Library Card Sign-up Month Honorary Chairs! For 25 years OverDrive has been on a mission to provide access to compelling, easy-to-use digital materials that reach, engage, and satisfy readers. Since 2002 we have worked with ALA member libraries to invest how libraries lend eBooks and digital audiobooks. In the spirit of continuous improvement and best practices, together with ALA we are engaged in library advocacy with publishers and authors to provide fair lending models and costs. Visit Overdrive.com to learn more. OverDrive's free Libby app is the easiest way to get started with digital books, audiobooks, and magazines from your public library. Libby is available for Android, iOS, Windows 10, and some Chromebooks. ALA Library Champions support ALA’s efforts in raising public awareness about the value of libraries and librarians. Thank you to Dollar General Literacy Foundation for their generous support of the American Dream Literacy Initiative.